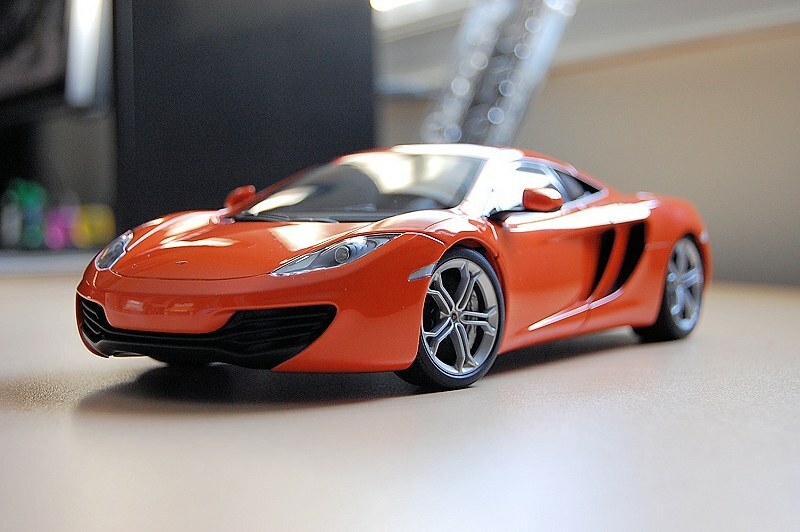 The McLaren 12C is the first production car to come from McLaren Automotive Group since the legendary McLaren F1. 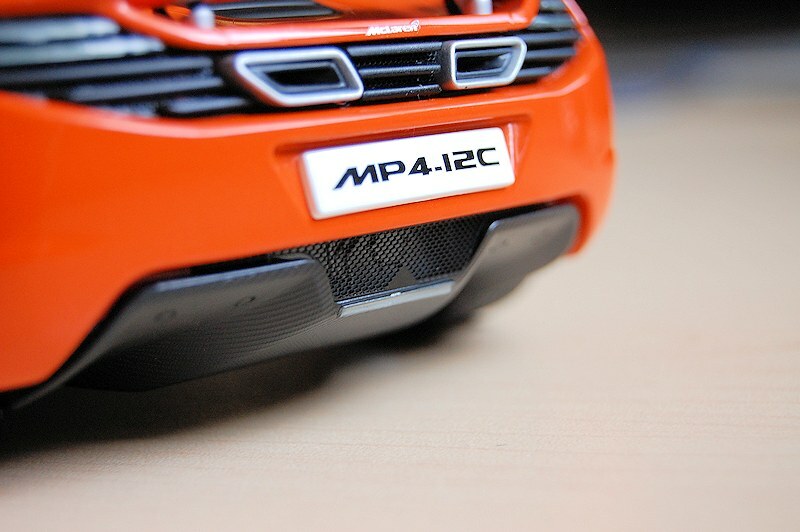 The car was first announced in 2009 with a complete production version to follow in mid-2011. The car features carbon fibre composite chassis, which is powered by a mid-mounted McLaren M838T 3.8-litre V8, twin-turbo engine developing 616 bhp and roughly 443 lb·ft of torque, quite impressive! The car incorporates many Formula One technologies, some of which include brake steer – where the inside rear wheel is braked during fast cornering to reduce under steer. 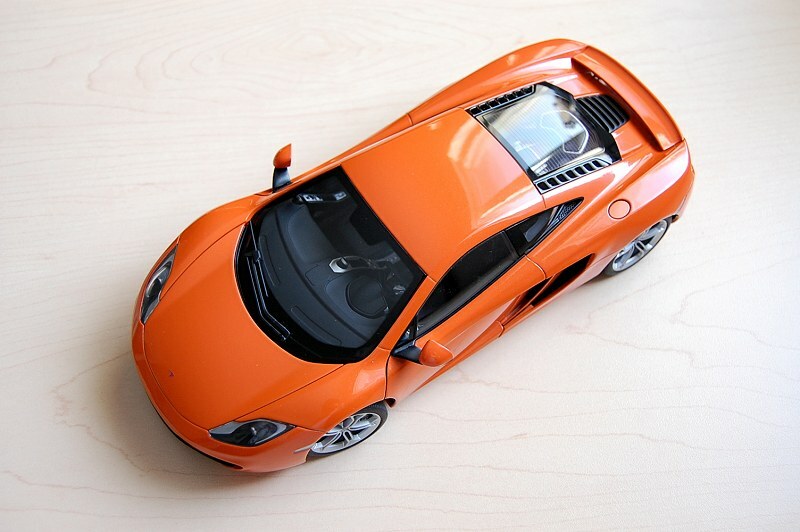 So how does AUTOart measure up with their 1:18 scale replica? 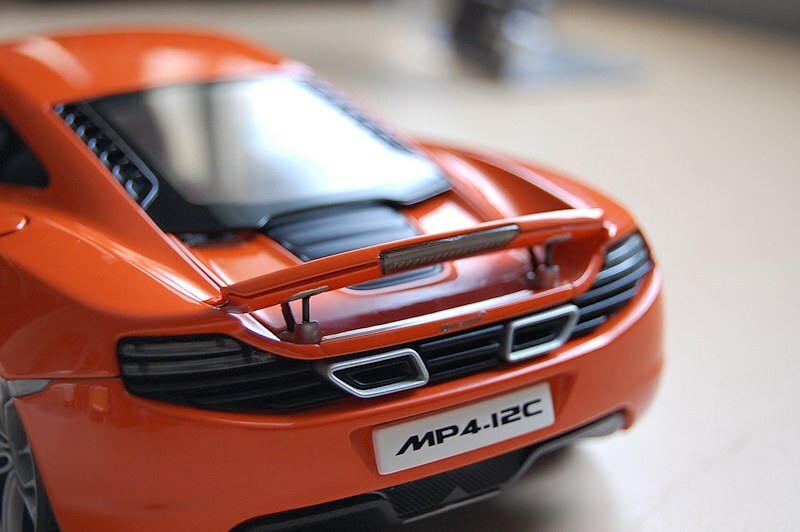 The McLaren 12C is another Signature Series release from AUTOart. Suggested retail is roughly $250 CND with our friends in Europe/Asia paying a whole lot more. Expectations are high and rightfully so. The exterior box is the same as of past Signature models, black with silver lettering and the usual brand logos. Inside the model is housed by a styrofoam shell. 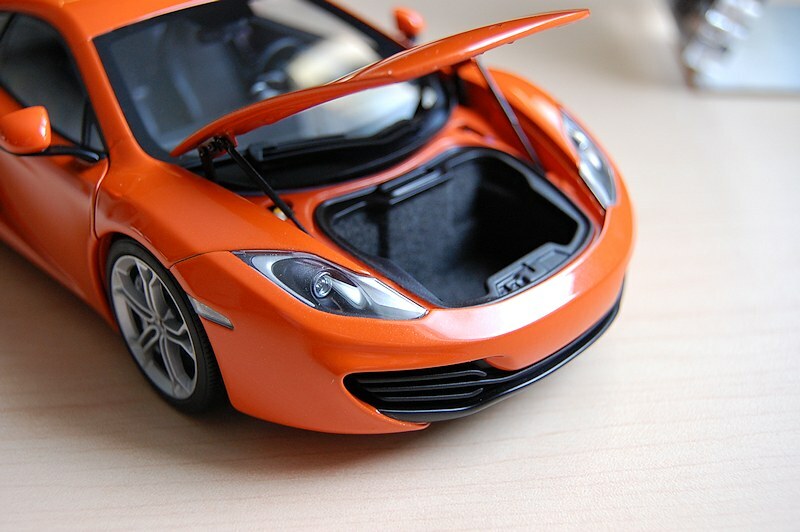 The 12C does feature a certificate of authenticity and booklet that highlights the best the model has to offer. 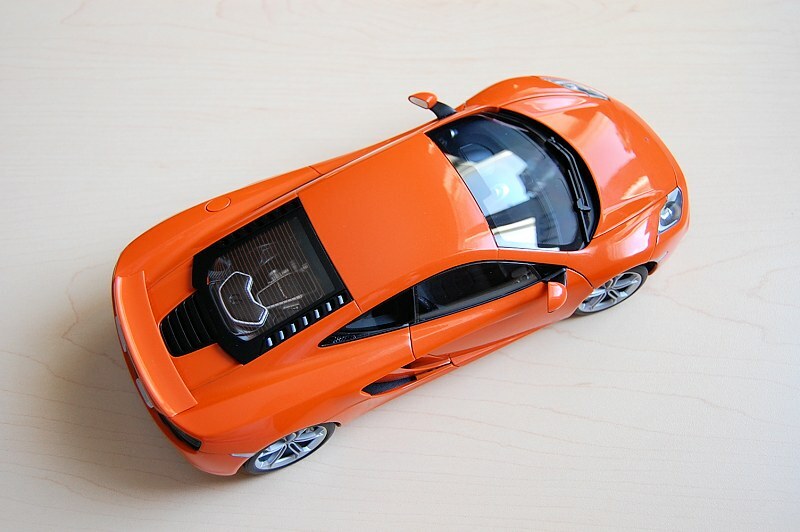 The model is offered in three colours to date, Red, Silver and Orange. I had the opportunity to see all three colours in person, orange is definitely the best of three. Silver is nice but too subtle for a car of this caliber and Red is a resounding PASS! Something is way off on the shade in my opinion. Paint work on the model is consistent and rich throughout with no noticeable premises or imperfections to note. The big miss on the model is the ride height. It is totally wrong! Under no circumstance should the tires tuck underneath the rear fenders. 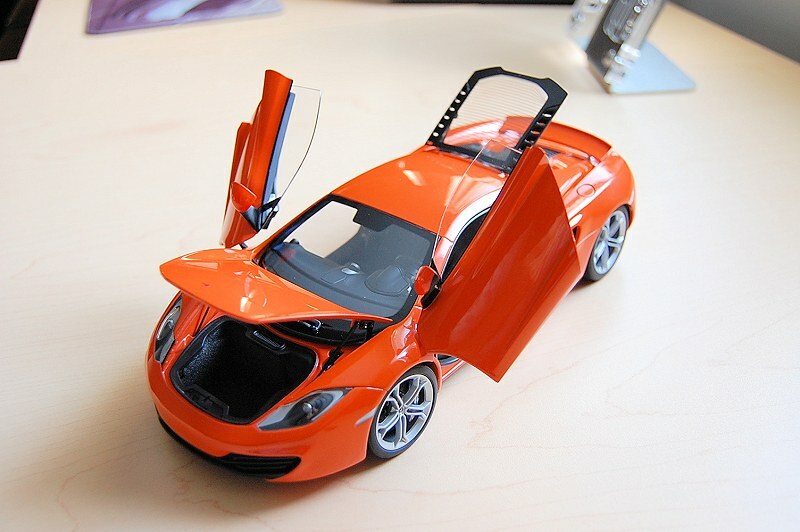 How someone at AUTOart signed off on the final production model is a mystery to me. Blatant disregard I say, and one that takes a model from near perfect to just plain embarrassment. The exterior shutlines are clean for the most part. 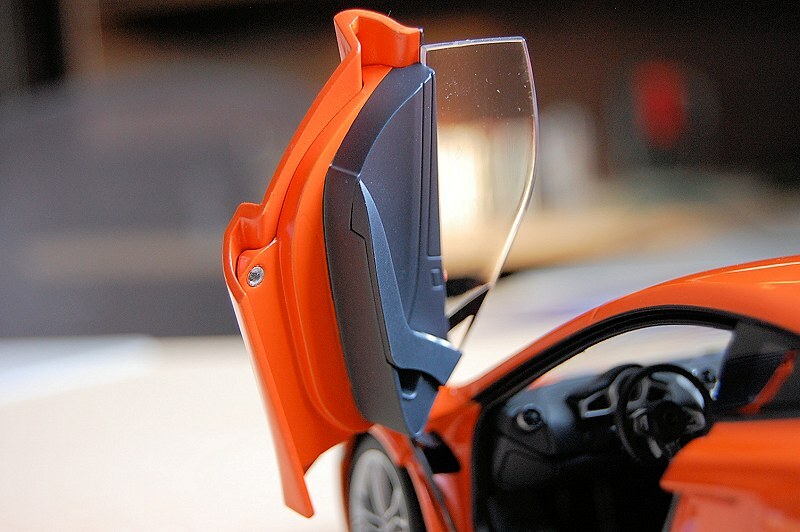 Though panel gaps on the doors are slightly large, most likely due to the keen engineering incorporated by AUTOart for the door open/close operation. New for AUTOart is the fuel cap access. I’m not sure I’ve seen this on other models, but please correct me if I’m wrong. Though a little finicky at first, overall operation is good and adds another level of realism to the model. Front fascia is nicely detailed too, what the photos don’t show you are the perforated grilles behind the front diffuser. 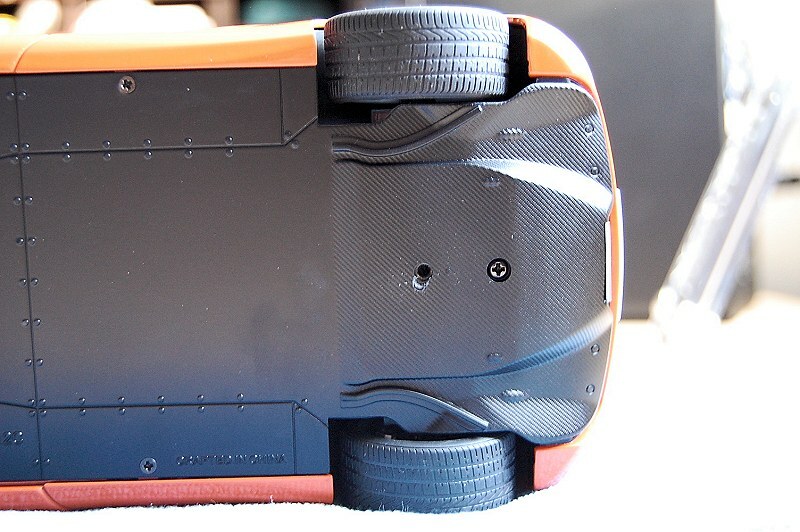 Rear is on par too, I absolutely love the rear mesh that exposes the transmission and motor bits. 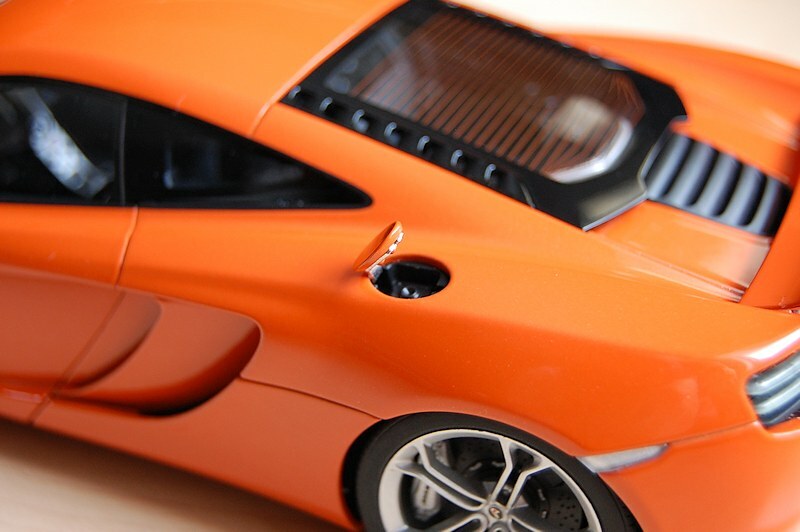 AUTOart even went as far as adding perforated grilles to rear quarter windows that provide cooling to the motor. 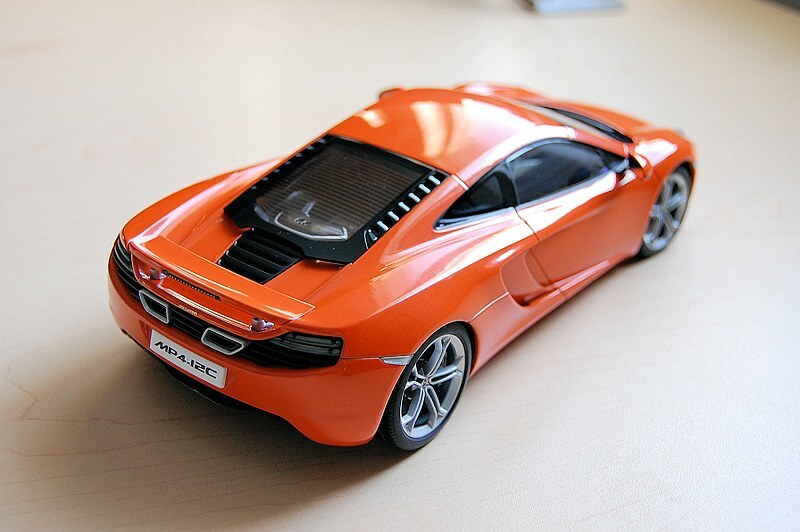 McLaren 12C also features a rear functional rear spoiler. Operation is smooth and effortless. 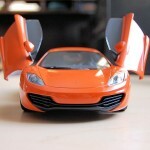 The wheels are highly detailed, but they wouldn’t be my first choice for the car. Rear rotors and brake calipers complement the entire package. 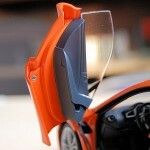 Access to the motor is provided through the rear glass hatch. 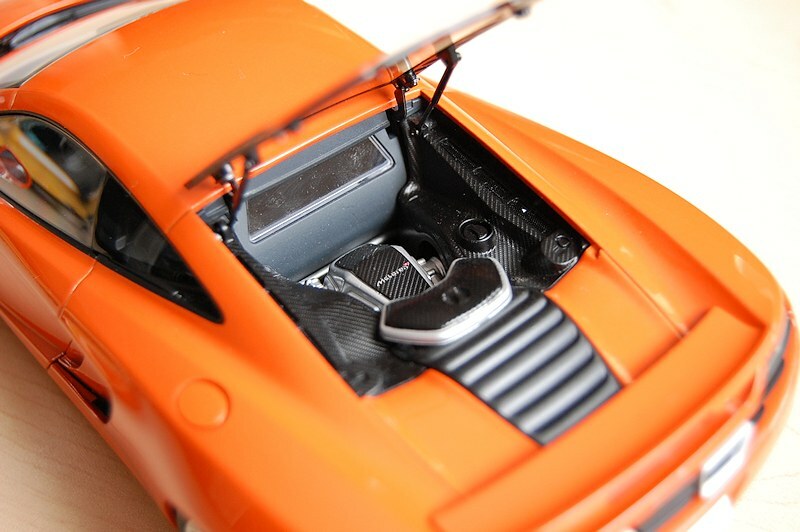 Note the detail on the hinge work and dual struts. Everything works in harmony here. Motor detail is good. 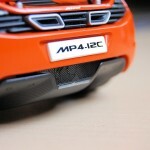 Nothing of the wow factor scale other that the surrounding carbon fibre bits. Front storage area is nicely carpeted featuring the same flawless hinge wok and dual strut mechanism. An added bonus that is not revealed in many photos is the fire extinguisher and first aid kit tucked just in front. Nice attention to detail! 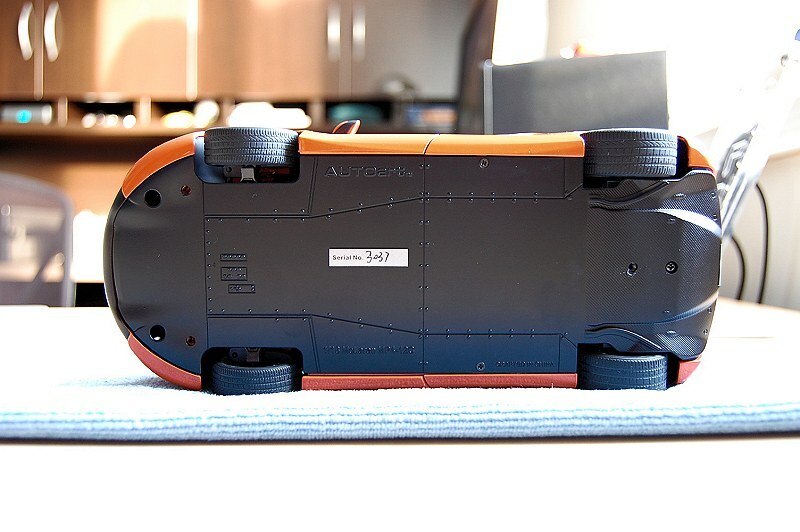 The undercarriage is a solid piece from front to back. 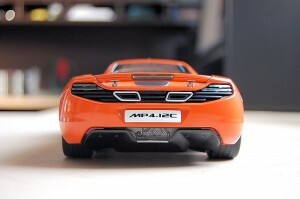 AUTOart tried to mimic the 1:1 with look-alike carbon fibre and aerodynamic lines. I think they succeeded here. 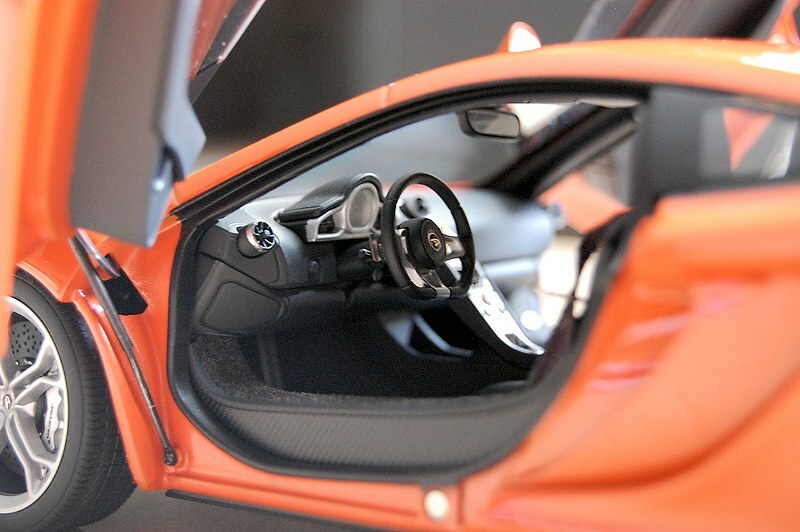 The interior is strong as usual with AUTOart replicas. 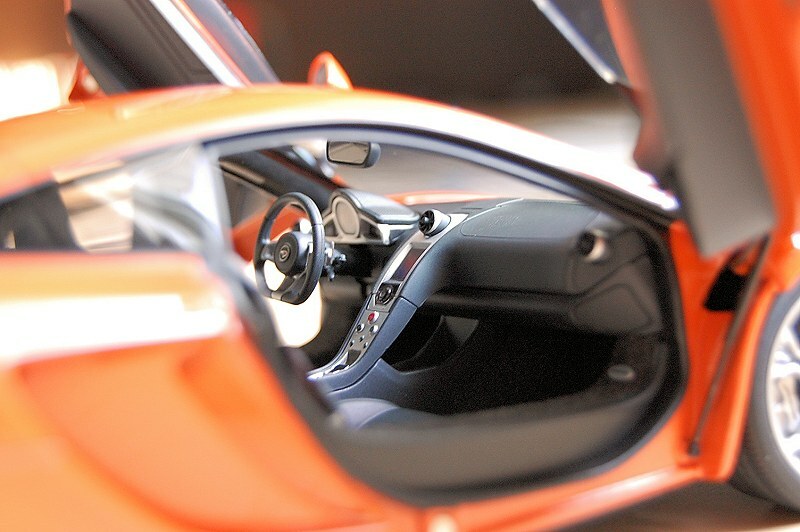 All elements of the interior are executed in great detail and provide the end-user that sense of realism once again. 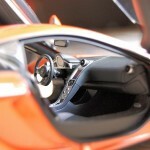 The fine detail is right down to the McLaren floor mats and logo on the passenger side door. 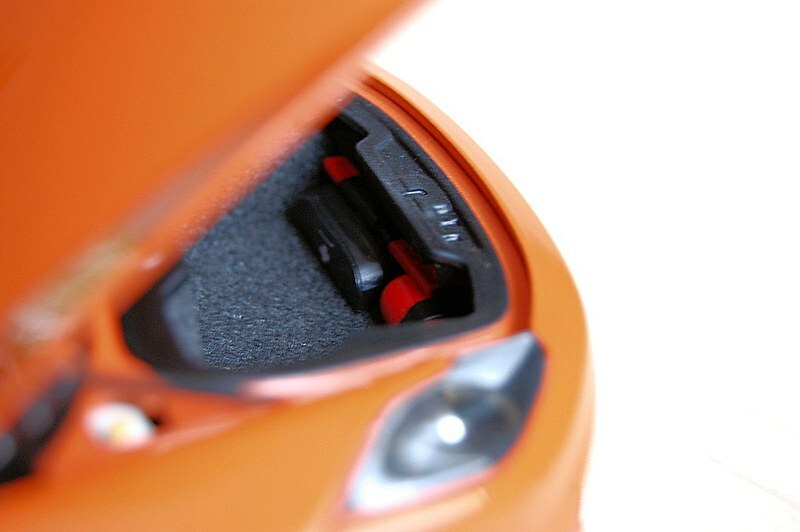 Also note the small magnets AUTOart incorporated into the design to help aid the door open/close mechanism. Very cool! Being a huge supercar fan I had high expectations for the McLaren 12C. Overall AUTOart hit a home run, BUT I keep thinking about the ride height that is oh so wrong. $250 a pop isn’t small potatoes folks. Yes, when compared to other manufactures that offer a similar product (i.e. 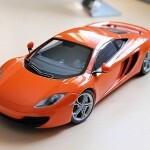 resin or inferior Minichamps release) this model may be a bargain. 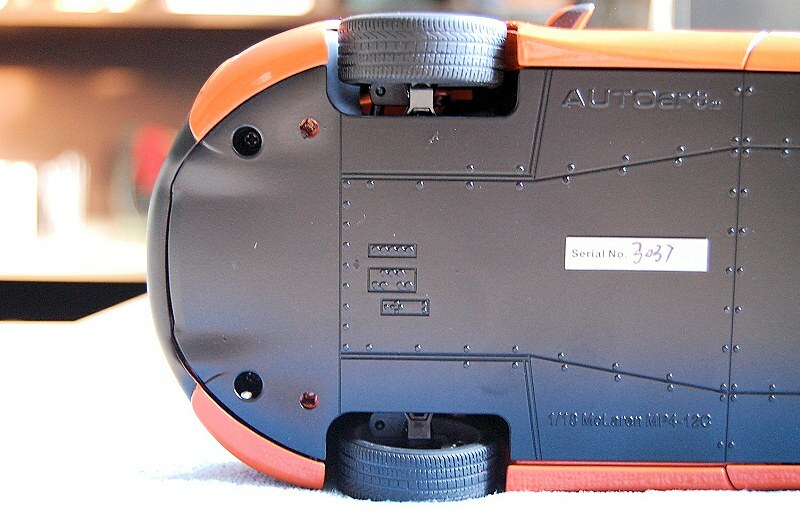 BUT AUTOart needs to set the bar; to release a model with this unsightly flaw is absolutely inexcusable and embarrassing. For that I’m not going to recommend the model. Enjoy the pics! 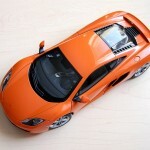 16 Responses to "REVIEW: AUTOart McLaren 12C"
I did like your review BUT! not to recomend this model is very harsh. I just got my own and I compaired it with the real one in the Newport beach dealer. You have to remember there are 3 driving modes and hight will change. 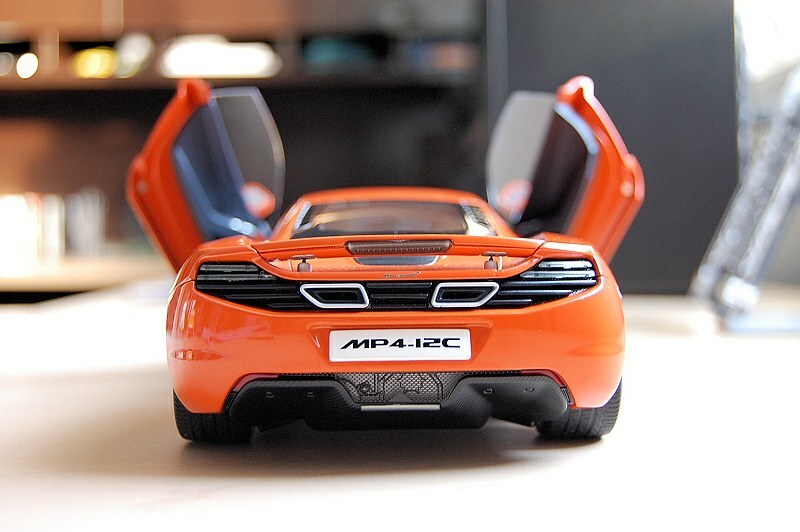 This model compaired with what is out there for the same price is way above especialy Minichamps. I got the one in red. 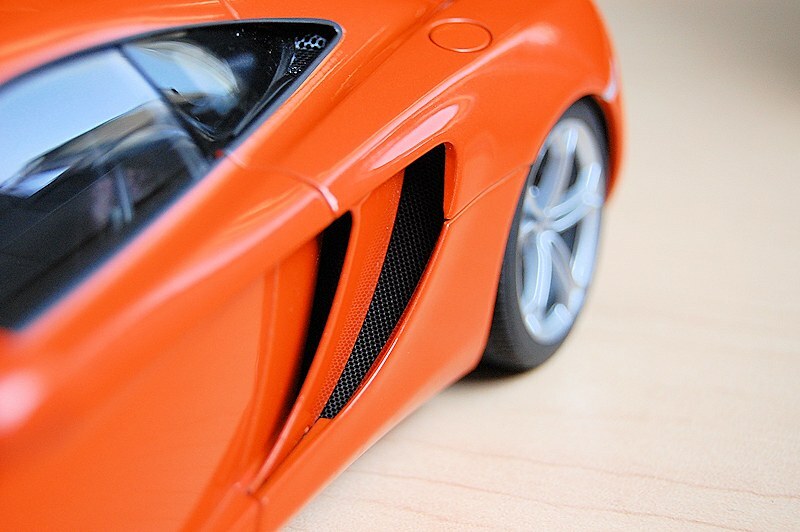 It might not be the same color that is on the real car but it is beutifully done and you have to remember that you can get ANY color that you want in the real thing! I do recomend this model. It is worth the money! Hi Franco, thank you for you comments. Everyone is entitled to their opinion. Some may consider my recommended as harsh, but I see it as so. 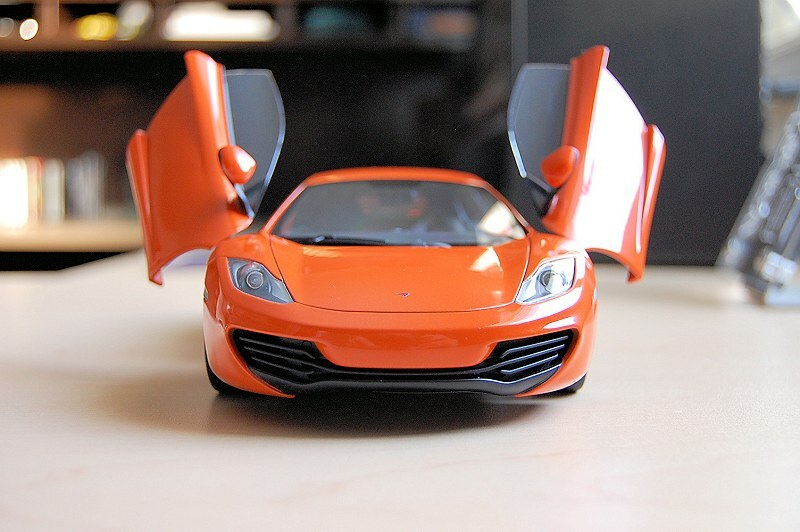 There was plenty of criticism about the ride height when first product samples were released. It is too obvious of a flaw to overlook. 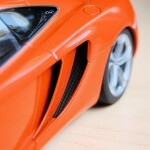 AUTOart being a leader in the hobby should of recognized and corrected the flaw, they decided to ignore. On average $250 a model I find unacceptable. Yes the model is very good in all other aspects, but I pay for 100% accuracy not 95%. If that is the case you must not have any diecast in your collection for there is no 100% accuracy from any model company. 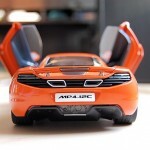 ALL diecast have some inacuracy in them, Autoart, Exoto, CMC, BBR and Kyosho. You can not expect 100% that is just not reallistic. Agreed. BUT there is a difference between slight and blatant oversight. 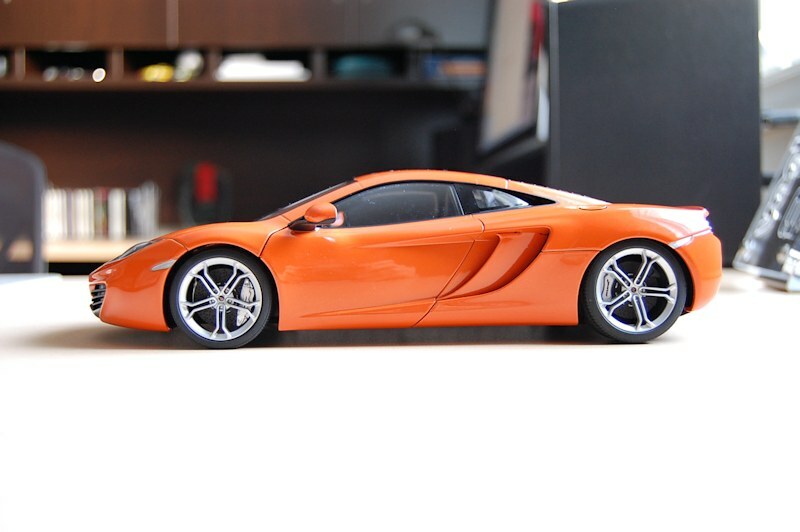 This is a blatant oversight on AUTOart’s part, someone not to familiar with McLaren could oblivious see the ride height was wrong – What is up with reverse rake? As I said this was brought to AUTOart’s attention from numerous collectors – I believe I even posted the issue on their FB page. IMO they choose to move forward without identifying the problem and correcting it, so they can live with the backlash from me and other collectors. Let’s agree to disagree. Cheers! Great review. I bought the red and while I was inspecting it, at a local shop, I did notice the ride height issue. I looked through about three to four models and they had the same issues, so I just settle for the best one out of the lot. Then when I got it home, I decided to see if I could do something about the height issue. 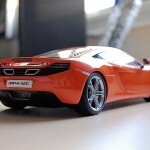 And I must say, this has got to be one of the easiest models from Aa to adjust the ride height. If you are still bothered by the stance, I would suggest to open the model up and fiddle with it’s suspension and where they mount on to. 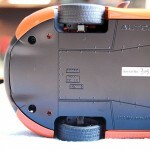 You can cut the springs or just add some styrene on to the mounts to get your desired stance. Mine turned out great and it looks more realistic now. Good luck! Cheers! Hi Alex, please send me pics or better yet complete a “HOW TO” on this topic. TIA! I also just got the red ($188) shipped. I must say that I am happy with the model. 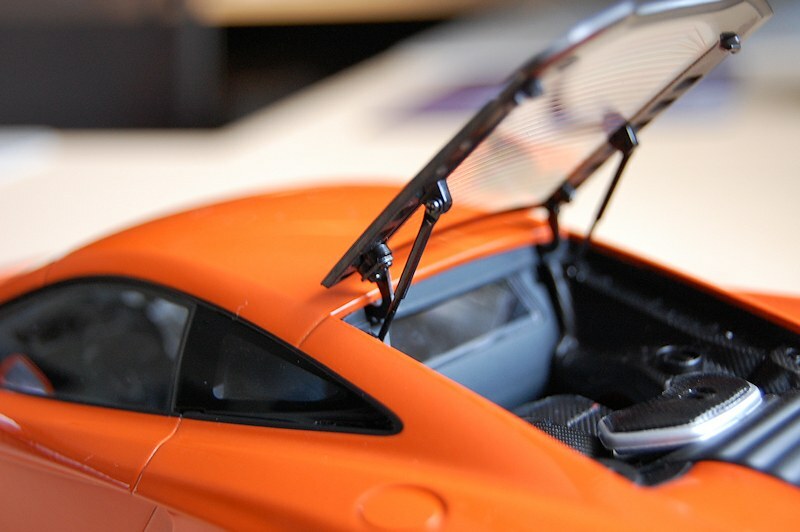 The ride height on mine is fine, the only issue is the left rear is a little too inboard, but the other is fine, the engine bay is a little disappointing, but mostly accurate, since the 1:1 bay is pretty lame. $188 shipped sound more like cost than retail. I’m very interested to see photos of your model. Please post pics, thanks. it was a pretty sweet deal, I have never posted photos here. Just imagine the model above with the wheels in a slightly different spot, I think some are just worse than others. Also I disagree with review assessment of red, it looks pretty good. I’d prefer to see photos. 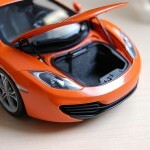 If you cannot host them please forward to info [at] diecastsociety [dot] com. I’m very curious to see. 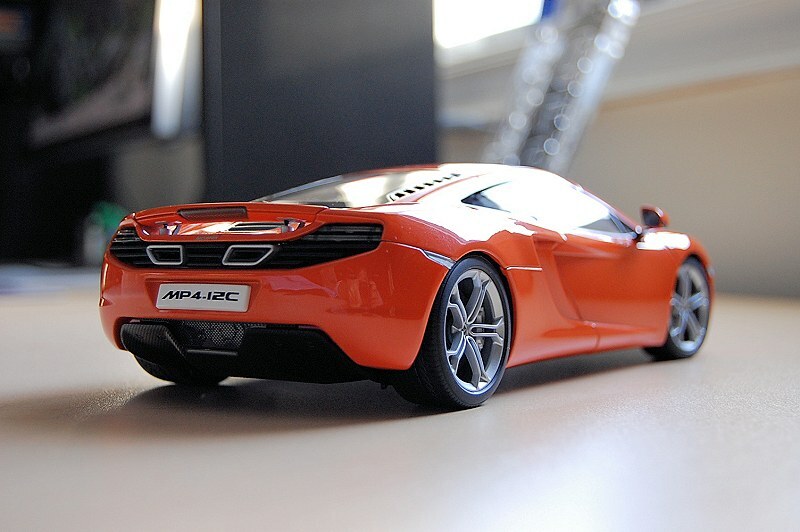 It is puzzling to me if this was the case why would AUTOart release official photos with the incorrect ride height? Thank you. Hi there, thanks for this review. I share your opinion about orange being the best choice. Small wonder it was sold out first in my favourite shop. 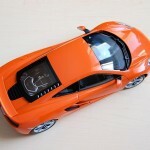 I´ve got mine in orange, too. 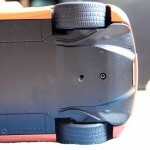 I noticed one thing about the ride height: In both my model and that of a German review page, ride height seems to be more appropriate for the rear left wheel, while rear right one has the problem described and shown in your review, agreed. 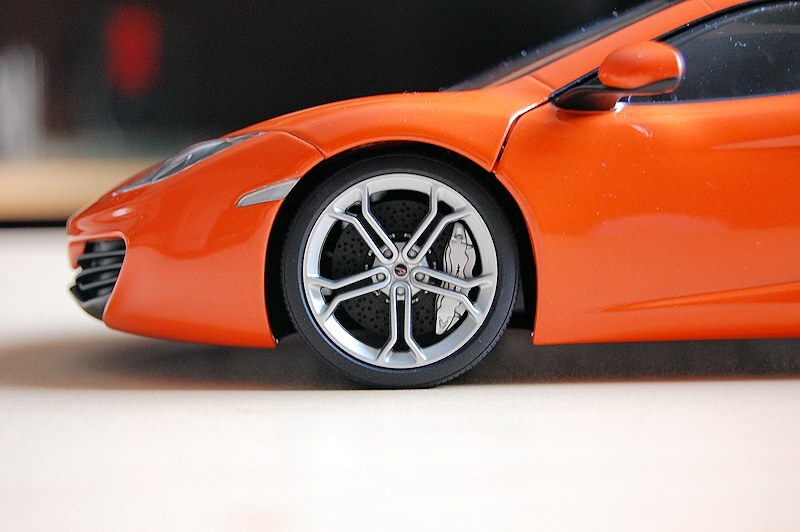 Perhaps it is a matter of how loose the wheels are on the model. The rear right one is a bit more loose on mine than the left, so that as a result, it dives deeper into the wheel arch when standing on its own four and has to carry its own weight. Hi, I did notice a very slight difference from the left side to right. 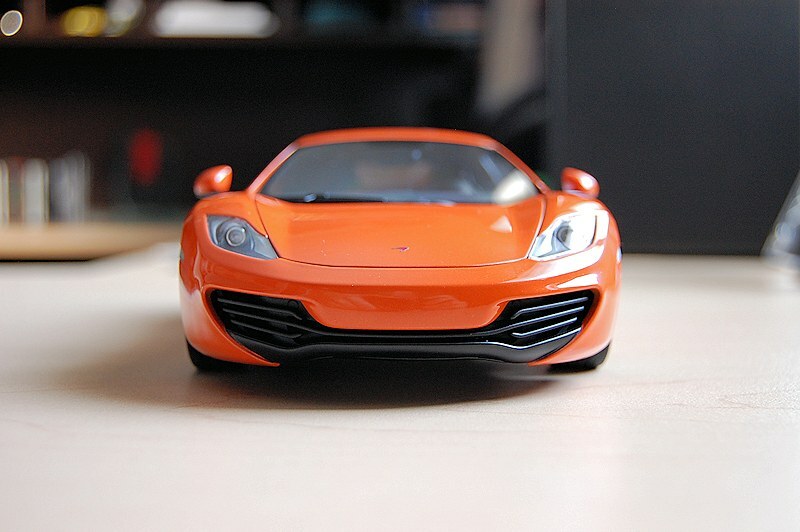 But still the over height is far from the production 1:1 car. 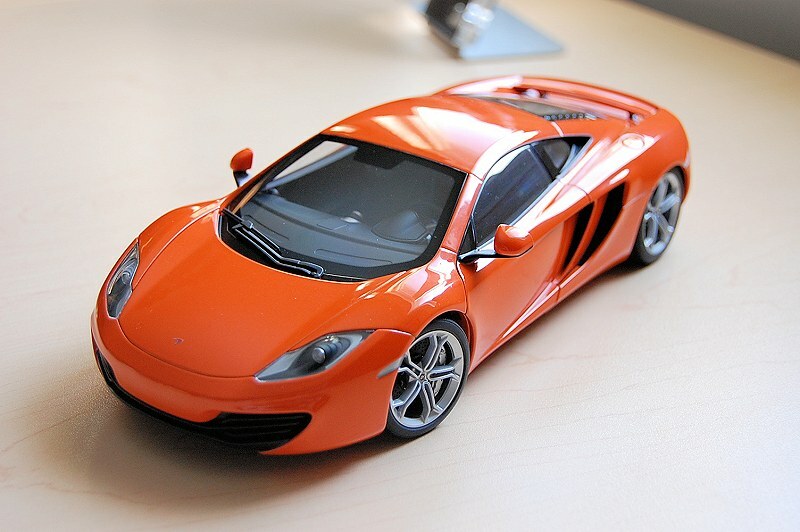 Sorry, this diecast for children 14 year and up, I’m aged 12, this is one of my favorite diecast. So, we are not dealing with illegal substances here. Buy it! I finally decided to by this car, and got it today. And i can say mine is just perfect. i got it for 86 euro with shipping. My favorite car is finally in my collection.